Oh no, FOMO. Jane’s credit card debt ordeal. Today it’s called FOMO, meaning the fear of missing out, and it applies to a generation of digitally interconnected Millennials, or those between the ages 18 to 34. Back in my day of baby boomers (or those between the ages of I’d rather not say), FOMO basically was KUWJ, or keeping up with the Joneses. Both terms point to the same thing – envy of others for what they do or possess, often accompanied by the desire to keep up through overspending that can lead to worrisome and even critical credit card debt. Reportedly of late, FOMO is growing at breakneck speed thanks to the prevalence of social media. More and more, remotely connected souls are excitedly comparing notes about their social and spending behaviour. Through emails and texts – or more often through social network posts replete with titillating images and links – young adults seem keen to announce to the world all that is wonderful about their lives. Looking on jealously, their peers seem apt to follow in stride, or perhaps go their virtual friends one better. I’d say a lot of the apparent happiness is being viewed through narrow lenses. Whose real life after all can be condensed in a social network post? Take the example of a person I’ll call Jane. A single professional at 30, she is an avid fan of social networks. Facebook, LinkedIn, Pinterest, and other gateways absorb her no end. Late last year a Facebook friend she has never met in person shared a photo album celebrating a grand tour of the ancient Mayan marvels found amid Mexico’s Yucatán Peninsula. Along with the photos came elated notes about the fascinating experience. Later, Jane chatted online about the photo album with another friend – this one known in the flesh – and it was decided on the spot that the two women would organize a shared trip to the Yucatan. Notably, Jane packed a cool new compact digital camera for the journey as she looked ahead to her own Facebook photo travelogue. Now, Jane went on the excursion sensing that she could not really afford it, particularly in the wake of all her spending over Christmas. But she had been working long hours with few breaks over the course of the year, and it was a cold winter, and she was feeling down and left out. She believed she absolutely was entitled to some exotic R&R. The trip went well at first. But unfortunately, with four days still to go in the seven-day journey, Jane came face to face with something resembling the wrath of the Mayan serpent god Kukulkna. It came in the form of the stomach-churning anxiety that often accompanies poorly managed credit card debt and a lack of attention to personal budgeting. At her luxurious hotel in Cancun, she discovered her platinum credit card did have a spending limit after all. Card payments were abruptly declined as she attempted the mere purchase of sunscreen and a couple of fashion magazines. Moreover, after visiting an ATM, Jane found she had an available balance of $27 in her chequing account. With no hope for extending her credit card debt, she sought aid from her travelling companion who could supply only a small loan amounting to not much more than pocket money. Sadly, the rest of Jane’s trip was fraught with humiliating moments as her companion begrudgingly picked up dual tabs for various expenses – everything from tour tickets to special meals and cocktails. As Jane said, she felt like a dog being fed scraps beneath a kitchen table. The story gets worse, but I won’t go into all the details. Suffice it to say, after Jane returned home she faced an unforeseen personal financial crisis for which she had no emergency savings since she, like so many other Canadians, has been living paycheque to paycheque. 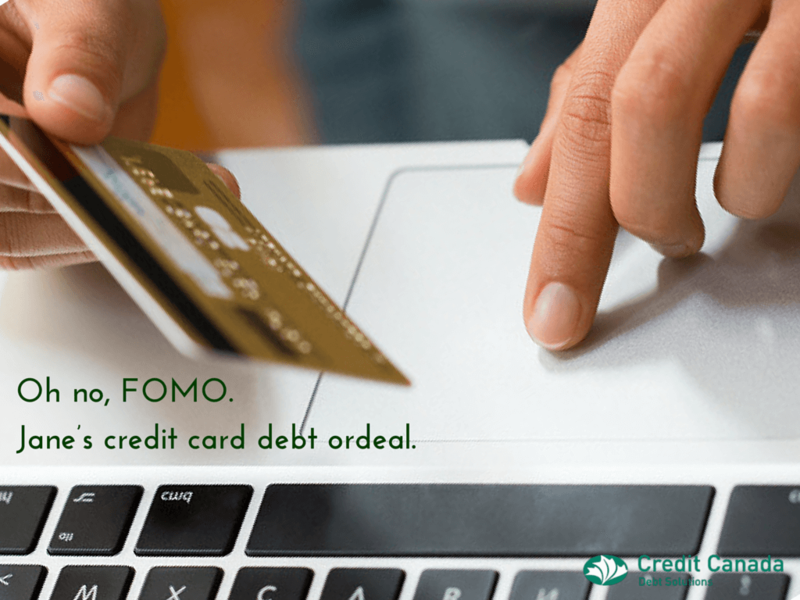 Fortunately, she recently took the initiative to get credit counselling to consolidate and affordably pay down all the credit card debt she amassed. The counselling – now ongoing – comes with financial literacy training that promises to help Jane conquer FOMO for good. Here, lessons can be taken by anyone who’s got into a financial bind through fear of missing out. In addition to practical learning about tracking spending, following a written monthly budget, and putting together solid plans for long-term savings, Jane is coming to grips psychologically with self-defeating financial behaviour. This includes treating money not as an emotional crutch but as a simple tool deserving of thoughtful use. It also includes awakening to the common sense wisdom that one should never splurge before taking care of important financial matters, like the creation of a substantial rainy day fund. Very importantly, the learning promotes self-reliance, which can have a hugely liberating effect on those who put too much emphasis on gauging their own joy and success by that of others. The truth is, self-reliant souls don’t feel left out. They know that they largely are in command of their own lives and that life is best lived on one’s own terms within one’s own means. Such people – be they Millennials, generation xers, or baby boomers – constitute what I call the smart money set. They live in the real world. They do so humbly, creatively, and with gratitude for the abundant blessings that immediately surround them in the form of family and friends they can actually touch, and communities they can actually experience. Just incidentally, Jane passed on posting her Facebook photo travelogue.